The potential of gaming and education is just the beginning of a new discipline of pedagogy worthy of investment. These educative experiences can be replicated in other fields such as clinical medicine and educational motivation for minorities. Technology plays a critical part of everyday life, but some schools are hesitant to embrace computer games, despite their popularity, to improve academic performance. Both educators and minority students would benefit if teachers could not only accept but would also embrace gaming technology in schools and classrooms. Smartphones are also becoming more user friendly with new gaming learning strategies. 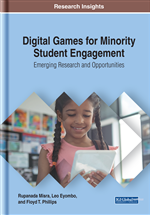 Colleges and universities should initiate courses of study to prepare teachers to use these new tools to educate minorities about the types of products available for use and the complex subject of gaming. A pedagogical rubric was developed to examine the educational aspects of games designed by preservice teachers, developed by policymakers and students. The focus of the rubric was to evaluate the characteristics of educational games created by teachers, with various categories in the rubric highlight thinking, exploration, inquiry, active learning, reasoning, and motivation, among the categories of the rubric, likely influencing students' engagement with the learning process as they solve problems. Minority students' engagement in the developmental of rubric fosters complex problem solving in gaming. No one will dispute the fact the computers and technology are an essential part of everyday life in the twenty-first century. One just has to look at the latest developments over the last twenty years: Twitter, GPS, email, and other technology has made everyday tasks much easier. Despite the fact that technology plays a critical part of everyday life, some schools are hesitant to embrace computer games, regardless of their popularity, to improve academic performance. Many traditional educators are reluctant to use computer games in common-core and curriculum goals. Educational computer games show tremendous potential to improve academic performance. Computer-game usage and popularity have been steadily increasing over the past twenty years; this fact has helped erode suspicion and ambivalence among educators. Academic educators are beginning to understand the charms of digital games and simulation as a new form of learning, motivation, engagement, and academic success in the twenty-first century. Video games can also help in medical education. Dempsy & Lucassen (1996) explored people’s knowledge, skills, attitudes, and behaviors in relation to health and physical exercise with video-game technology. Furthermore, the newly emergent physically interactive electronic games can potentially enhance young people’s physical fitness, motor skills, and motivation for physical exercise. The empirical evidence to support the educational effectiveness of electronic games in health education and physical education is still rather limited, but the findings are positive overall. Primack, Carroll, McNamara, Kelm, King, MLIS, Rich, Chan, and Nayak (2012) studied video games to provide physical therapy, psychological therapy, improved disease self-management, health education, distraction from discomfort, increased physical activity, and skills training for clinicians. Among the 38 studies, a total of 195 health outcomes were examined. Video games improved 69 percent of psychological therapy outcomes, 59 percent of physical therapy outcomes, 50 percent of physical activity outcomes, 46 percent of clinician skills outcomes, 42 percent of health education outcomes, 42 percent of pain distraction outcomes, and 37 percent of disease self-management outcomes. They concluded that the potential promise for video games to improve health outcomes, particularly in the areas of psychological therapy and physical therapy, cannot be ignored. Kron, Gjerde, Sen & Fetters (2010) studied medical students from two American universities. An anonymous thirty-item, cross-sectional survey addressed demographics, game-playing experience, and attitudes on using new media technology in medical education. They concluded that there was significant gender dissonance over favorite games, the educational value of the games, and the desire to participate in games that realistically replicated the experience of clinical practice. According to Kron et al. (2010) medical students who did not play video games held highly favorable views about the use of new media technology in medical education after being exposed to video-game lessons and training. They also found significant gender differences in game-playing experience and attitudes, possibly representing male video-game design bias that stresses male cognitive aptitudes. Medical educators hoping to create serious games that will appeal to both men and women must avoid this. Barko et al. (2012) asked a simple question during the study: “Why are Video games not used more in classrooms?” They concluded that there were three primary reasons why video games are not more used in classroom. Development challenges of creating games that are both successful educationally and as games.